This entry was posted in Lessons Learned, Seasonality. Bookmark the permalink. Wow. You’re not kidding about poor hay. Welcome to the world of making hay on Vancouver Island. The summer you described is typical May/June for us. We ALWAYS have that three day pattern in those month, sometimes into early July. And then it doesn’t rain for the next three months. Seems like, anyway. First cut hay is never good locally. People with cows around here have mostly gone to haylage (or baylage, depending where you live, as far as I can tell it’s the same stuff). Wrapped bales. Fermented. In NZ at least, they’re feeding that out – you can see the bales prepositioned around paddocks so that come winter all the farmer will need to do is take the plastic off, the bale is already in the right place. 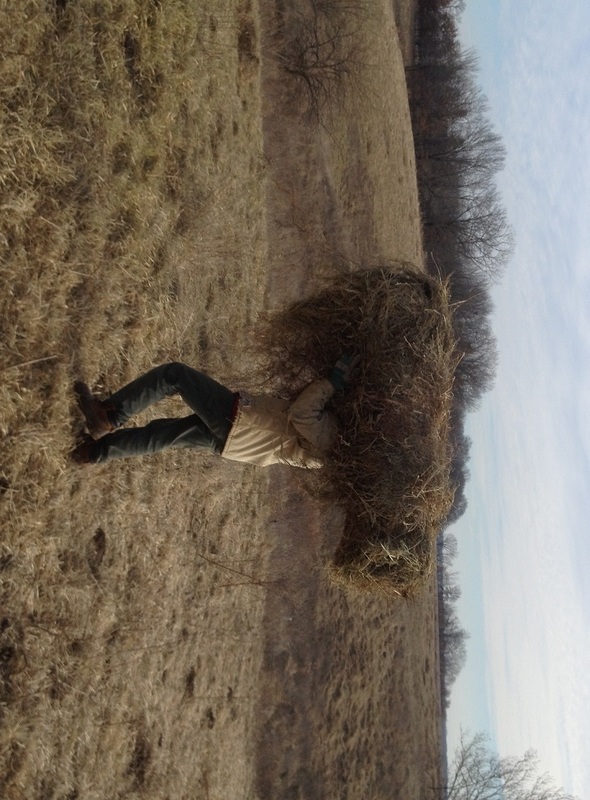 Personally, I need small square bales – I wouldn’t be able to move anything else. I really prefer small squares. Except for the carrying part. Then I really prefer tractors. Except for the cost, fuel and maintenance part. I’m farming a little south of in in western washington, and we have the same basic issues with haying weather. We need 5 to 7 days of clear and sunny and warm, and we don’t get that consistenly until july. But the grass is ready to be cut in april or early may. The solution that most farmers in this area, particularly those feeding cows, is to cut and round-bale and then wrap silage. If you can dry it it’s better, but you can bale it wet in 2,000lb bales and then feed those as you would the fresh grass. 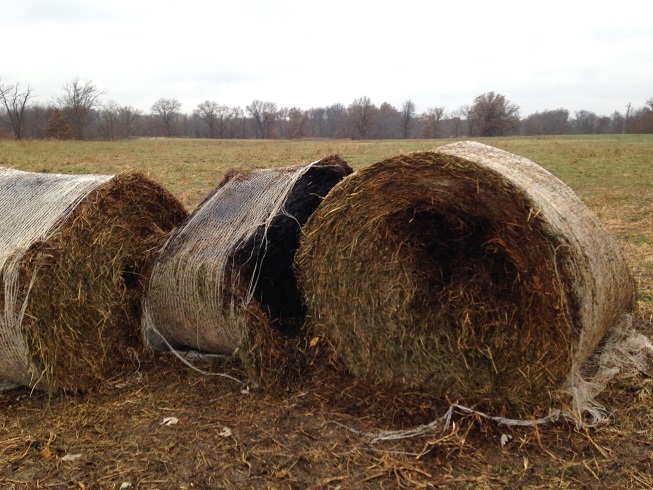 Tightly wrapped to exclude oxygen the bale will ferment, and cows actually prefer fermented grass to dry hay. Mine do, anyway. If you baled it wet it was heavy to begin with. Just add a bale wrapper to the mix and you’re all set. Weather-proof haying. Thanks. That’s a good suggestion for wet years. We get 4 or 5 cuttings each year here so we may have one bad cutting early but the rest turn out fine. Last summer was exceptional. I do want to learn more about making silage with forages, though I’m reluctant to grow corn. My mentor, Steve, grows non-GMO corn every year. This year he wrapped corn silage and his cows are doing great. So many options. Yeah, exactly what the cattle people here are doing. My reply kind of implied that the squares were being wrapped – nope. Big round plastic wrapped bales. Look like giant marshmallows dotted around.big paddocks, or stacked up on one side. And I too have heard they prefer the fermented hay. Sweeter maybe? 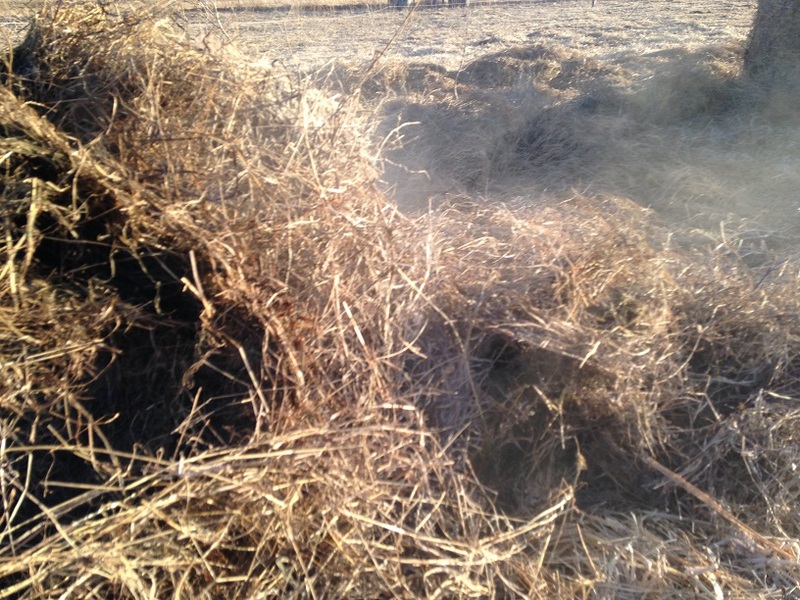 Can I ask what kind of equipment you need to do the round bale wrapping to create this- it is haylage? Do you wrap and leave the bales on the field for later feeding there, or bring them all up to a central location and have one big wrapping over a line of bales? I see something like this being done with sileage on the ground around here at the big dairies, but the fermented hay is intriguing. Thanks! I pre-place all my round bales for the entire winter and come spring end up with some thick mat areas of the outer crust the horses prefer to use as their B&B – bed and bathroom in this case! I live in a dif climate than you so in the snow covered dormant mths no problem but once the snow melts and growing season starts, if I don’t have the thick mats harrowed within at most about 5 wks in cool springs, I am harming and/or killing my grasses smothered under with no daylight. I don’t have chickens or Dung beetles to help with this task. What happens to your Dung beetles in your winter are they hibernating or still at work? Wow. Reality. I’m sorry to see how it went but I do appreciate the honest insight. God bless. We only have enough cleared land for pasturing our small goat herd here in Eastern Ontario and have to buy in hay each year. This year we probably suffered from the same weather pattern you’re describing and got our usual 1/2 of our requirement from a very late 1st cut and it was pretty woody by the time it came in. We only got 1/2 of the rest of what we needed because of the relentless rain in the later summer and fall and had to scramble to find enough to get us through. Not as many people doing small squares anymore and most had their own needs to fulfill. We now have a hodge-podge of bails, many of which our picky herd (they’re goats, after all) simply rip apart and drop on the ground. Three years ago it was drought, then two years of cold weather and too much rain. Seems there’s no such thing as normal anymore. You should check your perception of normal. Read what Henderson had to say about making hay nearly 100 years ago. In fact, any of the old farming books talk about odd years in quick succession. I think there was even something in Arator about that…but I would have to check. Small squares are, I think, the way to go. Until you carry them across ice and snow or until a portion of the barn loft collapses under their weight. Then it’s all a nuisance. Not that the cows say thanks.